Growing up I always heard people taking about granola. I knew it was made with rolled oats, but other than that I had no idea what it was. I grew up in a Spanish household and granola did not make the breakfast items list. It was a mystery food for me all wrapped in intrigue. Store bought granola was the way I started. Those little cups with yogurt, you know what I mean. Probably not the most healthy of granola, but still, I felt healthier just because I was eating it. Cut to the internet era. Since there is such an abundance of information online, I knew that I would be able to find recipes to make my own. What I didn’t expect was to find millions of different recipes out there; with fruit, without fruit, with nuts, without seeds, plain, healthier…. So many options, but I was not discouraged. 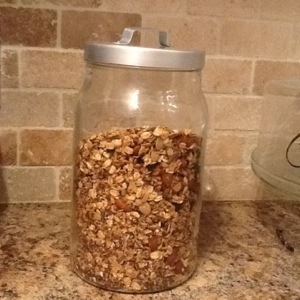 I started by making highly rated granola recipes from trusted blogs and websites. Some worked, some didn’t. I even burnt a few batches. Through trial and error I’ve gotten more confident so I’ve been venturing off and mixing recipes. Taking what we enjoyed from one and mixing it with what we enjoy from others. 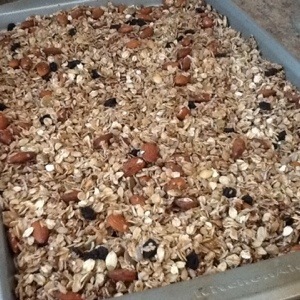 My granola recipe is adapted from the granola recipe found in the cookbookQuinoa 365. I liked the ingredients they used and I really liked getting the nutritional benefits of quinoa. The only thing is that I found it very sweet. To cut back on the sweetness I changed the maple syrup to a mixture of oil and agave nectar in a ratio of one to one. I know this is not my final granola recipe. As we find out more about nutritional benefits of different seeds and nuts, I’m sure I’ll be adapting this recipe once again. This recipe can be tailored to your tastes; add more fruit or less, don’t like coconut then add more sunflower seeds, you can’t really go wrong. 1 cup dry fruit, ie blueberries, cherries, cranberries, raisins or a combination. In a large bowl, mix all dry ingredients. In a smaller bowl mix the oil, agave nectar and vanilla. Stir to mix and pour over the oats mixture. Mix well to ensure all ingredients are evenly coated. Spread on a baking sheet and cook in preheated oven for one hour. Once cooked, place baking sheet on a cooling rack to cool and add dry fruit, if using.